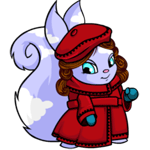 The Day of Giving dawned cold and bleak in a certain corner of Neopia Central, where dozens of pets without families huddled together in the Pound. They had spent the night under the large window in the reception area, staring up at the few stars that managed to peek through the gathering clouds. By morning, the fluffy white puffs had turned dark gray, and snow had started to tumble out of them. The window frosted over, obscuring their view. She nodded, looked up at the window and sniffed. They had been here the longest, Cabb and the Usul. Many of the others had come and gone in the past few months, but no one wanted to make friends with a cold metal Shoyru or a slimy Maraquan Usul. As another wave of quiet settled over the group, the front door to the Pound burst open. Every head turned. Some feathers ruffled. Some scales shifted. But, the only figure in the doorway as a very familiar one, the Techo that was responsible for taking care of them. His name was Dr_Death, and he always wore a scowl. Except today. Today, Dr_Death had a wicked grin on his face, and he was carrying some kind of strange ray gun device. Cabb recognized the blue barrel and the brightly colored knobs and switches right away — it had to be an invention by one of the Alien Aishas he’d met on the Space Station so long ago. Someone just got a Day of Giving Present, Cabb thought to himself. He didn’t want to distress the other pets with what he knew about the device. As it turned out, he didn’t have to. Dr_Death’s grim grew even wider, something Cabb hadn’t thought was possible, and he pointed the ray gun directly at them all. “What are you doing?” the Usul shrieked. He fired the ray gun. It hissed and smoked, and then two flashes of red and green light filled the room. By the time the smoke cleared, Dr_Death was the only pet standing in the Neopian Pound. Cab rubbed his head. He was almost certain that his casing was dented, and he felt so dizzy that he wondered if the circuitry underneath hadn’t been damaged as well. Holding out his other hand, he swirled around in a circle to get his bearings. Wherever it was, it was dark. Pitch black. The walls were grimy, almost slippery, and they were uncomfortably close. When he reached to touch them, they felt like brick, or maybe cinder block — he couldn’t tell. Cabb squinted, hoping that his vision had just been temporarily knocked off kilter, but no. The darkness remained, pressing around him. He stood, trying to decide what to do when he heard a voice. Where it was coming from was uncertain. Cabb guessed that it was from the other side of the wall of his square whatever this was, but it was muffled and low. He could barely make out the words. The Aisha handed him a Fuzzy White Towel. “You’re a mess,” she said. A Draik hovered next to her, eying Cabb with suspicion. Grateful, Cabb rubbed the towel over his eyes, clearing off the lenses. When he was done, he could see them both properly. The Draik was a lovely shade of mint green that he had never seen before, and the Aisha’s two-tone purple gown drifted elegantly a few centimeters above the tile floor. The towel was black now, and he handed it back to her. She turned around, tossed it across the room into a Plain White Sink, and smiled at him. “Well, you’re certainly much better off now that you’re not there anymore,” the Aisha said. “Umm … actually …” he hesitated, but then he told the two of them the story about Dr_Death and his translocation ray. “Could you give us a minute?” the Aisha asked him. While they were talking, Cabb looked around the kitchen. All of the fixtures, from the sink to the table to the chairs, were plain, elegant white. The only color in the room was in the tiles underfoot, which were arranged in a blue and white checkerboard. Everything was meticulously clean. He didn’t get out of his seat to look around, afraid that he would track more soot all over the kitchen. The Aisha and Draik returned. Both of them started to speak, and then stopped, not wanting to talk over each other. They stood in an awkward silence for a few seconds before the Draik nudged the Aisha and nodded. “Do you mind if I ask where here is?” he said. “You’re in the Haunted Woods,” the Aisha answered. Cabb could live with that. He had heard that the Haunted Woods were full of all kinds of terrifying things. It reminded him of his adventures on the Space Station, so long ago. He just nodded. The two sprung forward and embraced him. “I’m Cabb,” he said, before remembering that he already told them his name. If he could have blushed, he would have. It had finally gotten warm again. The last clump of winter snow had fallen from the Dead Pine Tree in the backyard a week ago, and Skyleur and Zacroda had decided it was time to take a few days to go to Neopia Central to restock the supply closet with foods that weren’t, well, gross. Cabb went along with them, in part because he didn’t want to sit alone in the stone castle, and in part because he had grown to enjoy their company. The narrow road between the Neopian Bazaar and the central Neopia Central was crowded. Many of the pets jostling their way along the path were obviously from different worlds: there was a Nimmo with a garland of flowers around his neck and a Lupe with what looked like a wicked sunburn. Among the throng, Cabb caught sight of a very familiar face. “Jareithe!” he called out. Her neck snapped up, and she grinned. Cabb stepped off to the side of the road, and waited for his old friend to make her way toward him. Skyleur and Zacroda waited with him. “What happened to you?” the Usual asked, oddly animated. “What happened to you?” Cabb asked. “I got translo-beaminated, or whatever, to a cozy cottage over there,” she pointed toward the Money Tree, which loomed up over the shop roofs of Neopia Central. “Ebsidia said that I could stay in the basement with her. It’s beautifully furnished, and Toremy has his own little water bed.” Toremy was her petpet, a Maraquen Grackle Bug. “What about everyone else?” Cabb asked. Cabb smiled. While he had been in the Pound, he couldn’t think of anything but finding a permanent home. Now that he was out, he could finally appreciate that, in its own way, it had been a home. His friends had been there with him. He looked at all three of them, Jairethe and Skyleur and Zacroda, and he smiled. Inside its casing, his heart felt warm and full.